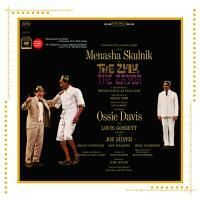 The Zulu and the Zayda opened at the Cort Theatre on November 10, 1965 and ran for 179 performances. It was billed as a “comedy with music” as opposed to a full-on musical, probably because it lacked any big dance numbers. But as the production boasts eleven songs that were integral to the story, I’d say it’s a musical despite the lack of dance. The story is set in South Africa – modern day for 1965, so apartheid is still very much a way of life. An aging Jewish man is unable to live on his own and so moves in with his sons and grandsons. No one wants to watch after zayda (Yiddish for grandfather) so the butler’s brother (the Zulu) is employed to grandpa-sit. Cultural differences get in the way for a time, but in the end all is resolved. This is a feel-good comedy that got sound reviews for the production as a whole and shining reviews for Menasha Skulnik, who portrayed the zayda. Other notable cast members are Louis Gosset as the Zulu, Ossie Davis as the butler brother, Peter DeAnda as the son, and Christine Spencer as the daughter-in-law. The Zulu and the Zayda was lyricist and composer Harold Rome’s (of I Can Get it for You Wholesale fame) last show. I’ll give Rome credit for somehow managing to integrate African and Jewish musical styles into a cohesive show. While there are very distinct differences in the styles, they blend together through the use of the same instruments and overall lightness of composition. The result is an even split between “African” and “Jewish” numbers that present a flavor of each culture for the audience pointing out both the similarities and differences . I wish I could say that I was enchanted by the newly-released original cast album, because I really like the idea of juxtaposing the two cultures during such a turbulent time in South Africa. But I wasn’t that impressed. Partially, I’d say it’s because of the untrained voices in the cast. As this is a comedy with music, not a musical, I’m sure the actors were cast more for their acting and comedy skills than singing ability. Skulnik, as the elderly funnyman, doesn’t really have to have a great signing voice; he just needs to have the heart and the shtick. Gosset and Davis trade off leads on the African-influenced songs and aren’t bad, but I’d love to hear “How Cold, Cold, Cold” performed by someone with a really good voice. By contrast, Christine Spencer as the daughter-in-law sticks out like a sore throat with her highly trained vibrato sound. The music director should have asked her to tone it down a bit and cut the boys some slack. The songs are nice enough, but without any standout pieces among them. Without context the jokes fall flat and the big-sounding numbers strike me as repetitive. I’m willing to bet that if you saw show in 1965 this would be a nice memory album and therefore more enjoyable. If you have no recollection of The Zulu and the Zayda, you’ll probably only want this album as a novelty or to complete a collection.